Ideal for situations that demand extreme cleaning and powerful stain removal, HydroBoost additive instantly increases the oxidation potential of Advanced Peroxide Cleaners. The HydroBoost mixture MUST be used within 15 minutes to achieve the full effect of the product. Application to the substrate within 5-10 minutes is ideal. Plan your work accordingly so that you can apply all mixed product as quickly as possible. Do not return unused product to original container. 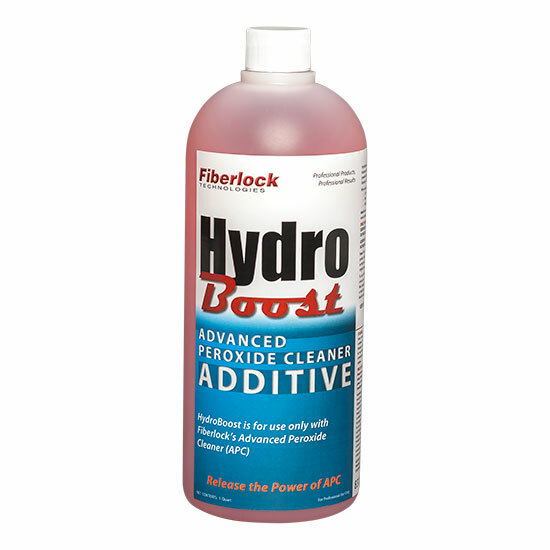 To use HydroBoost simply add it to Fiberlock’s Advanced Peroxide Cleaner at a rate of 16 ounces per gallon. One quart bottle of HydroBoost will make two gallons of useable product. Mix contents thoroughly and apply within 15 minutes of mixing. Apply with a standard pump or hand trigger sprayer. Follow applications guidelines listed on the Advanced Peroxide Cleaner label for detailed application information. Store securely closed and upright in original container. Avoid shipping or storing below freezing or above 100°F. If product freezes, thaw at room temperature and shake gently to remix components. Store in locked area inaccessible to children.